Right now, U.S. Hispanics have a whopping $1.7 trillion in purchasing power, which is larger than the GDP of Canada, Russia, Spain, or Australia. As such, they account for a huge market that brands are still struggling to effectively tap into. Here's some information that will prove useful for any brand looking to reach them. Almost one-fifth of the current population is Hispanic, and this proportion is set to increase over the next few years. In fact, the growth of the Hispanic population has been the main reason for the nation's population growth since 2000, and Hispanics are currently the second-fastest growing demographic, right behind Asians. Another demographic trend that advertisers need to keep in mind is the fact that a majority of Latinos — slightly less than two-thirds — were born in the United States. Why is this important? Because younger generations of U.S. Hispanics have different experiences than their foreign-born counterparts. This doesn't mean that they're rejecting Hispanic culture; far from it. Instead, new generations are embracing aspects of Hispanic culture — language, music, love of family, etc. — while also creating a new set of cultural touchpoints. Not only that: According to research conducted by AdAge, 25.8% of children in the U.S. ages 9 and under are Hispanic. Even though it's too early to be marketing to this group, brands should be aware of the implications that this will have on marketing to their generation as a whole. This means thinking about how a maturing Latinx population will influence pop culture, language, and purchasing trends. 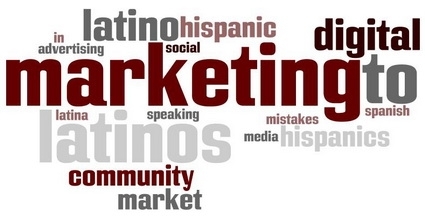 If you're a brand looking to reach Hispanics, you have to be careful about which language you choose. While many Hispanics are bilingual, they might prefer to watch Spanish-language television or visit Spanish-only websites, and if they do consume English-language content, it may be on sites that cater specifically to English-speaking Hispanics. That being said, studies have shown that even those who use Spanish as their dominant language of communication tend to use English when conducting online searches or consuming content. That doesn't mean, however, that brands should exclusively use English in their ad campaigns. Not only would that exclude a significant number of U.S. Hispanics, it would also represent a missed opportunity for brands to connect with the Hispanic audience, especially given that Spanish-speaking Hispanics tend to have increased loyalty to those companies that advertise in Spanish. In fact, major brands, including McDonald's, have used content in both English and Spanish to great effect. Language is an important part of culture, and it makes sense that Hispanics would be drawn to the brands that recognize that. It's all well and good to talk about what appeals to the U.S. Hispanic audience, but none of it matters if you're not reaching them where they are. Hispanics spend more time per week (nearly 10.5 hours) using the internet on their smartphones than the rest of the population (8.4 hours), and generally stream more videos on their devices than non-Hispanics. Hispanic adults are also more likely to access social media via their smartphones, with the most popular platforms being Twitter, Snapchat, and Instagram. In general, the entire audience has a reputation for being digitally savvy, so it's important for brands to come up with engaging content that is optimized for mobile viewing. According to eMarketer, the growth of ad spend on U.S. Hispanic media has been higher for the past several years than that of total media, a trend is likely to continue. But, there's still a discrepancy between the percentage of ad budgets that are allocated to reaching the Hispanic audience and the percentage of Hispanics as a proportion of the U.S. population. It's my hope that this gap will narrow considerably as brands grow to understand the demographic, and its importance. Source: Published originally on MediaPost.com, 4 Facts About The Hispanic Market You Need to Know, by Parker Morse, May 8, 2018.